1. Calais to Costa del Sol. – Quickest way. 2. Santander to Costa del Sol via Salamanca, Caceres, Seville. 3. Calais to Costa Blanca via Rouen, Bourges and Millau. 1. —- Calais to Costa del Sol. In times past my journey to southern Spain needed to be done as quickly as possible, so for the benefit of those who may also be in a hurry, here is what I consider the quickest route with some sites listed along it.. The journey starts either from the ferry terminal or the EuroTunnel in Calais, having taken an evening crossing. My plan is to drive the 66 miles to my first stop. I take the A16 which is a free motorway as far as Boulogne. The road then becomes peage until it reaches Abbeville. If you wish to avoid the toll, you can head down towards the town and join the N1. Just before Abbeville, there is a service area, Baie du Somme. I stay here for the night. I don’t normally recommend stopping on service areas, but this one has dedicated caravan bays and the motorway police frequently visit. The next day I drive 300 miles to Poitiers. From the service area, I take the A28 to Rouen which is a free motorway. The route then follows the A154 which later becomes the N154. Before that you need to cross or go round the City. My choice is to take the road marked N15 on old maps but on newer ones it’s the D6015 to Pont du l’arche, cross the A13 and join the A154. As you go through Igoville, there is a handy SuperU supermarket and filling station with an entry off the roundabout. The entry to the pumps is caravan friendly. The 154 is a good dual-carriageway road that continues until it meets the N12 at Nonancourt. Here you turn left along the N12. The route rejoins the N154 at Dreux and continues to Chartres. Keep to the ring road around the City until it meets the N10. From Chartres it is a single, mainly straight carriageway but I usually find that traffic is light and free-flowing. I follow the N10 all the way to Chateau Renault, where just beyond the town I join the A10 motorway. There is a fee to pay at the machine before the barrier will rise. The motorway crosses Tours and some miles beyond, a toll section starts. Before the pay station there is an option to rejoin the N10, but I usually stay on the motorway and pay the toll charge before leaving at Junction 30. I make my way to Camping du Futur. My next day’s run is around 270 miles. You have a choice between the A10 peage motorway or the toll-free N10, but the N-road is a very good dual-carriageway that will take you all the way to Bordeaux. There’s a ring-road right around Bordeaux so you can go either way. I usually choose the southern side – not the airport side. The dual-carriage-way, for the next 100 miles used to be toll-free, but since they made improvements to the junctions, you now have no alternative but to pay a toll. My next stop is very close to the border, leaving the motorway at Junction 2. I stop for the night at Camping Larrouleta at Urrugne. Next day, within 30minutes you will be across the border and into Spain. 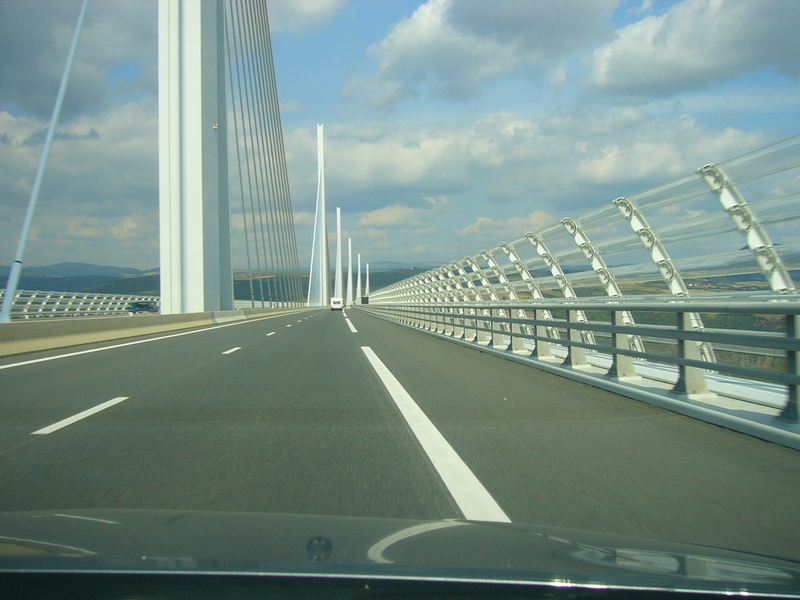 Very soon there’s a toll barrier where you’ll be charged a couple of Euros to use the AP8 motorway. Within 100 metres of the toll barrier you’ll see off to the right, the first Spanish filling station – usually cheaper than those in France. Within 11 miles look out on the left for the A1 intersection. There’s an A1 sign earlier which goes right but that will take you to San Sebastian. The road which is dual carriageway and toll-free at first winds its way along the valley, before beginning its climb to higher ground. Eighty or so miles later, just before Miranda de Ebro you have a choice between the toll motorway (AP1) or staying with the A1. Both roads meet again some 50 miles later, but if you choose the toll route you’ll miss going through several towns and villages; you have the option of stopping at two or three service areas and unlike France, you won’t pay for the caravan. 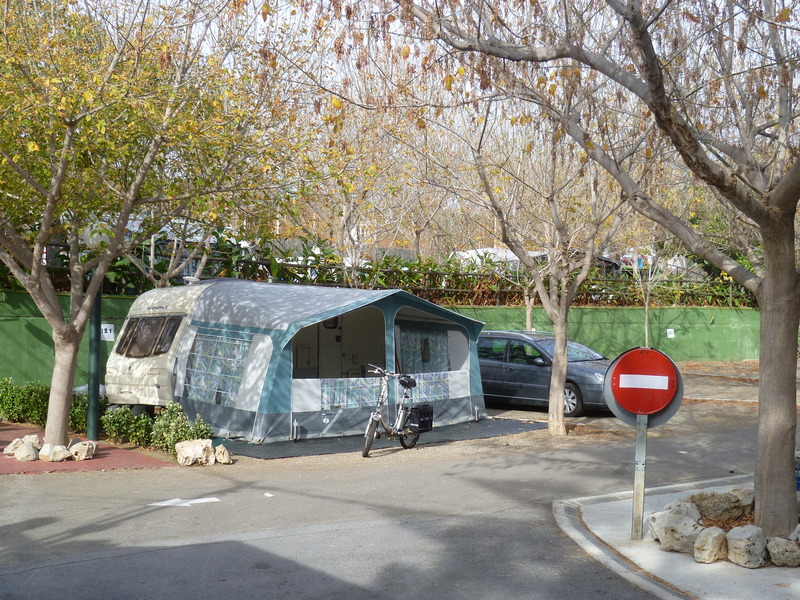 After having driven 150 miles you will arrive in Burgos where you could stop for the night at Camping Fuentes Blancas. There are also some toll motorways around Madrid but I’ve never found a benefit in using them. When you continue your journey, to rejoin the A4 means a tow through the town, which in the mornings, can be very busy. Therefore I follow the road I used on arrival and rejoin the motorway at the same junction. The dual carriageway continues for the next 130 miles where at Santa Elena there is another pleasant stopover at Camping Despeñaperros. However I usually continue with the journey because in another 160 miles I will be at my destination. But before then, I need to turn to the A44 after another 22 miles. The dual carriageway continues all the way to the coast. The road crosses Granada but there is no need to leave the dual carriageway. Eventually the road meets the A7 which is the motorway running all the way to Algeceras. My destination is El Pino in Torrox. The journey has covered 1280 miles, it has taken approx 24 hours of driving time. If I left home on a Tuesday evening, I will have arrived in Malaga on the Saturday afternoon. Camping du Futur. – Poitiers. I’ve used this site several times in the winter months having arrived in Calais by Shuttle in the evening. After filling up with diesel, I’ve set off for Abbeville where I’ve spent the night in the Service area at Baie du Somme. 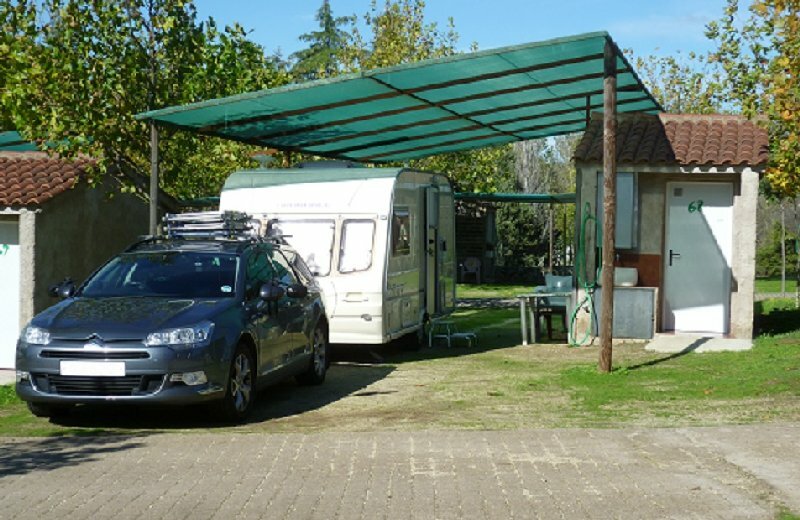 I wouldn’t normally suggest staying overnight in aires however the A16 service area has dedicated parking for caravans and is regularly visited throughout the night by the Autoroute gendarmes. Also they have a useful restaurant and toilet facilities. From Abbeville to Poitiers is around a 300 mile run. 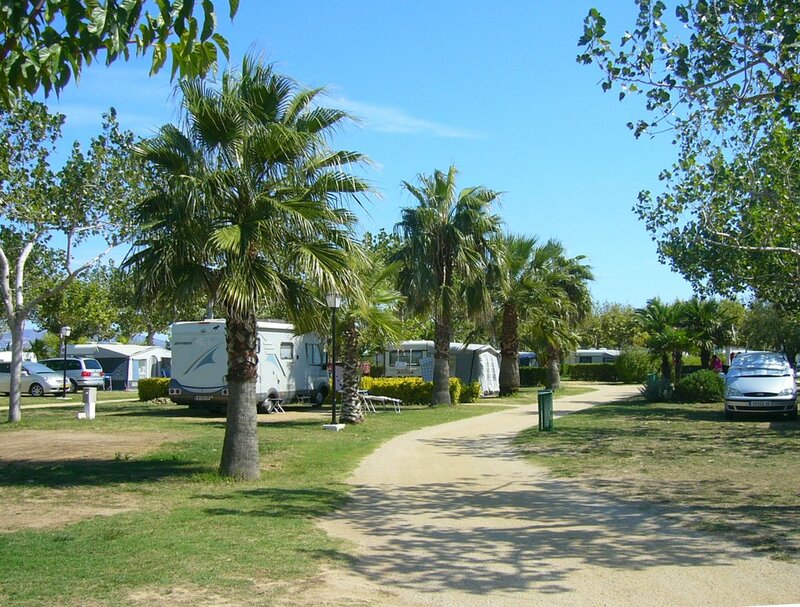 Camping du Futur is conveniently located close to Futuroscope and the historic town of Poitiers. The site is open all the year and they give discounts for ACSI card holders. It makes a popular stop-over on journeys along the A10 and N10. There are 54 touring pitches, marked by hedges, with a scattering of mature trees. All the pitches have electricity (6/10A Europlug) although it may be that cables need to be passed through hedges. All the access roads are well surfaced. The toilet block is in a traditional style, open at each end. It’s well maintained and kept very clean with push button showers and some washbasins in cubicles. A children’s play area and a swimming pool is available. Also there’s a supermarket with a filling station in the nearby village. 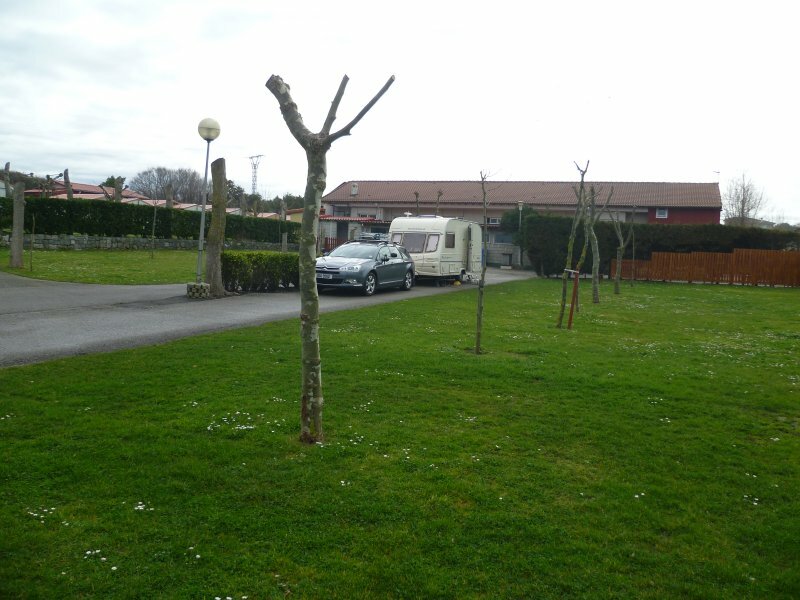 Camping Larrouleta is an all year site located within the Basque country. The site includes a lake which has a sandy beach and is ideal for fishing. On-site amenities include a swimming pool which is covered in the low season. 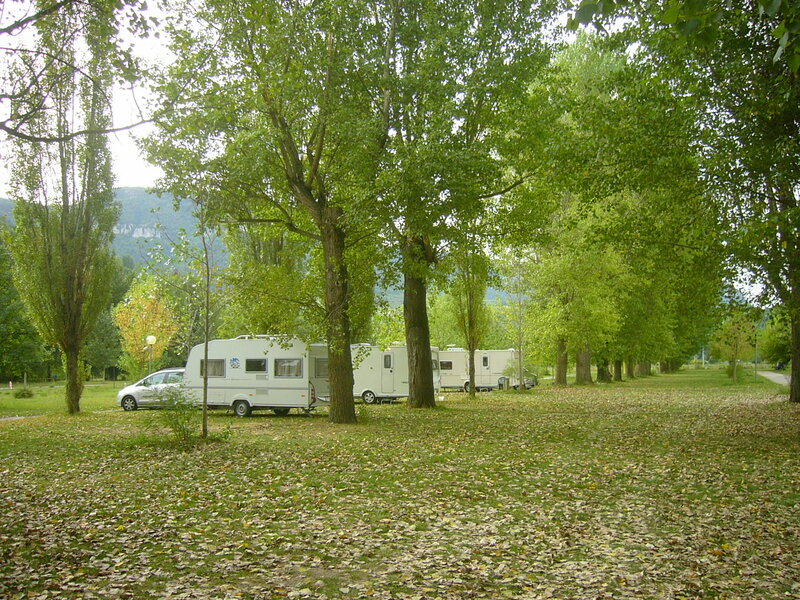 There are more than 300 touring pitches which are of a good size with many of them shaded by poplars. Most pitches have electrical connections with a 5amp supply. There are also some super pitches which have electricity, water and drainage for which a supplement is charged). 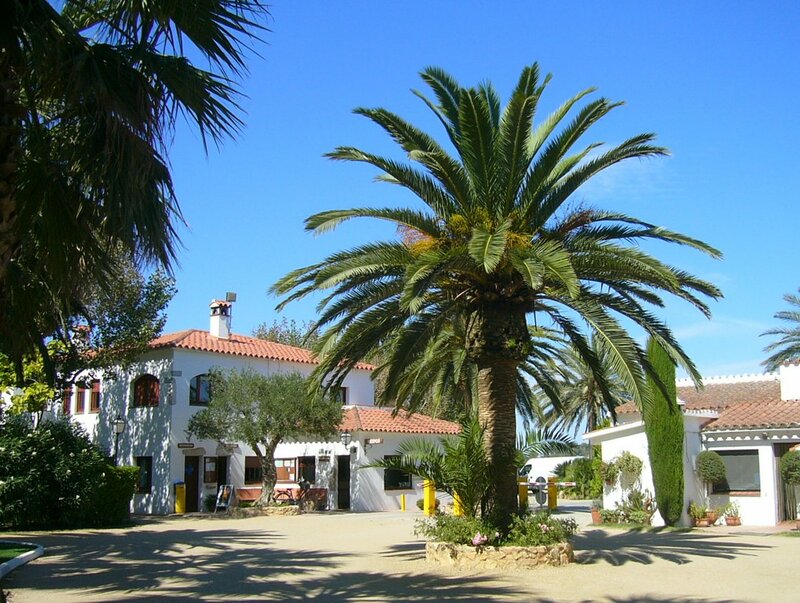 Larrouleta is fairly close to the A63 motorway which makes it a useful overnight stop en route to Spain. However, it is also very convenient for exploring Hendaye and Saint Jean-de-Luz. During the winter months only one toilet block is open. It has hot showers, toilets and washbasins in cubicles. In a nearby room there is a washing machine. Discount available for ACSI card holders. 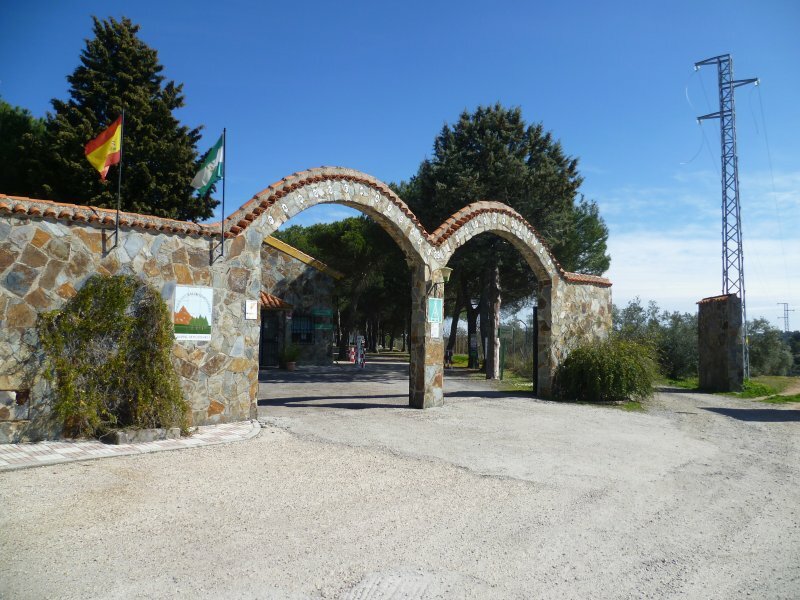 Fuentes Blancas is a municipal camp site situated in a park on the edge of the town. There’s a mixture of mobile homes and pitches for touring vans placed back to back on several roadways. Power bollards are equally spaced between the pitches, all with a 6amp supply. 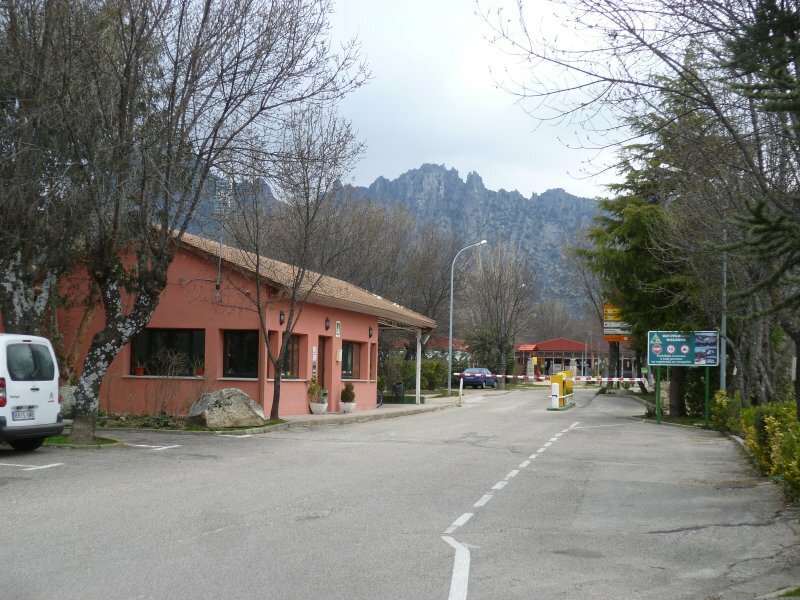 Being close to the motorway, the site is popular as a stop over for those travelling to southern Spain or on their way back to the ferries or France. At the entrance there’s a restaurant/bar which is also popular with visitors to the public park. 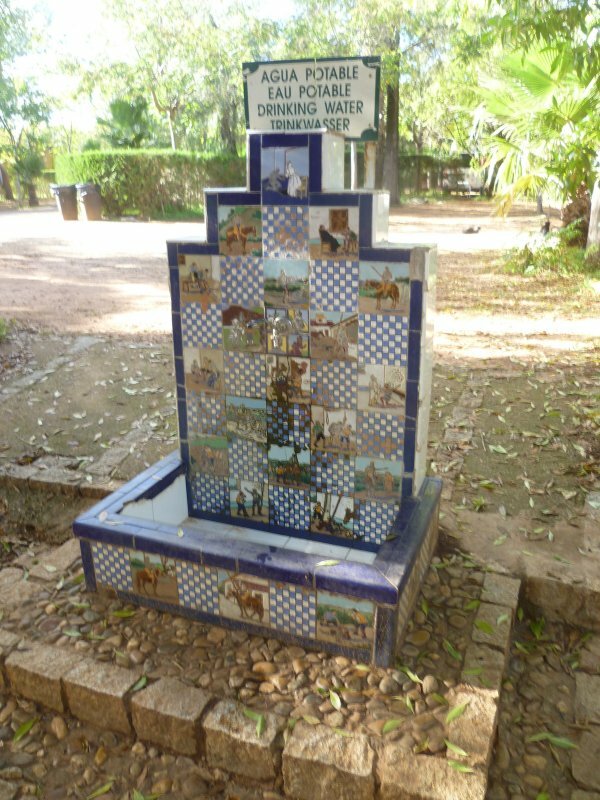 There are five blocks which contain toilets, showers and handbasins with hot and cold water. However, during the winter months only one block is in use which is heated. None of the water taps on the site are functional during the winter, so it becomes a long walk for the facilities or Aquaroll filling from some of the pitches. There is an internet connection but only from the reception/bar area and it has an additional charge. ACSI cards are accepted with a discount being given. If time allows, the Cathedral is worth seeing, as is the Castle. 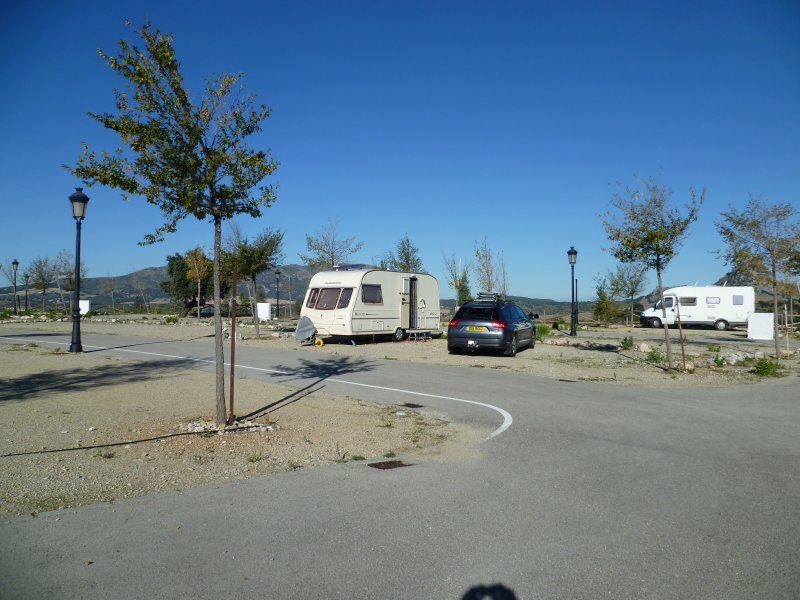 The campsite is on the outskirts of the village, very close to the A1 motorway to the north of Madrid at KM57. It’s a large site mainly filled with mobile homes and bungalows. I would imagine that during summer weekends the site would be very noisy but when I visit in November or February, the residential part is deserted and the shop and restaurant are closed. Motorvans and tourers have a separate section with a toilet block nearby. On the parking area there are several electricy bollards, some of which have a water tap. There is an internet connection available but it’s charged at €4 per day. ACSI cards are given an out of season discount, but being a Category 1 site, the charge is at the top rate of €19. This site is 47Kms south of Madrid and some distance off the motorway but it’s possible to arrive at the entrance without going through the town. If it is to be a first visit then it really is worth trying to stay a second night to take the opportunity to visit the nearby Royal Palace. 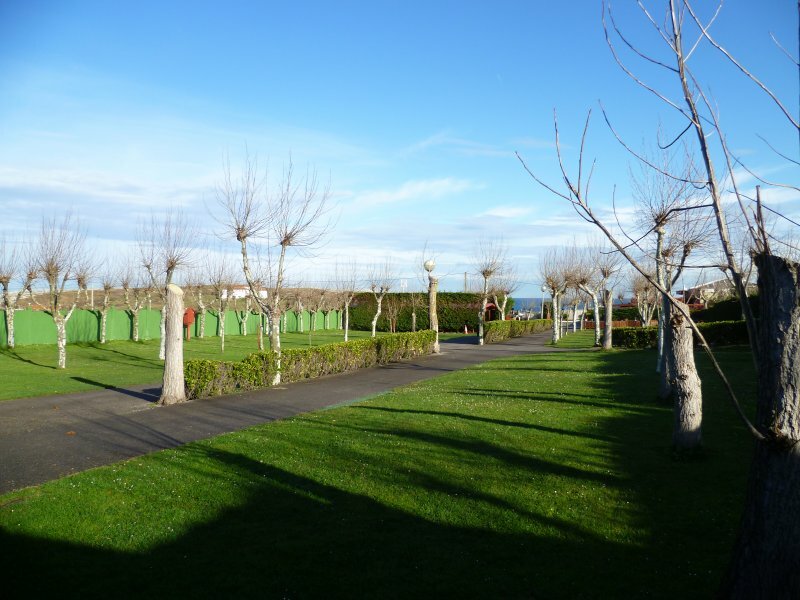 The site is situated alongside the River Tajo in a park-like situation with mature trees. There are 162 touring pitches, all with 16amp electricity set on flat grass amid tall trees. The site has been given a No 1 Category which it may have warranted a few years ago however with it’s broken tiles and missing hooks in the shower block, it’s now in need of some TLC. 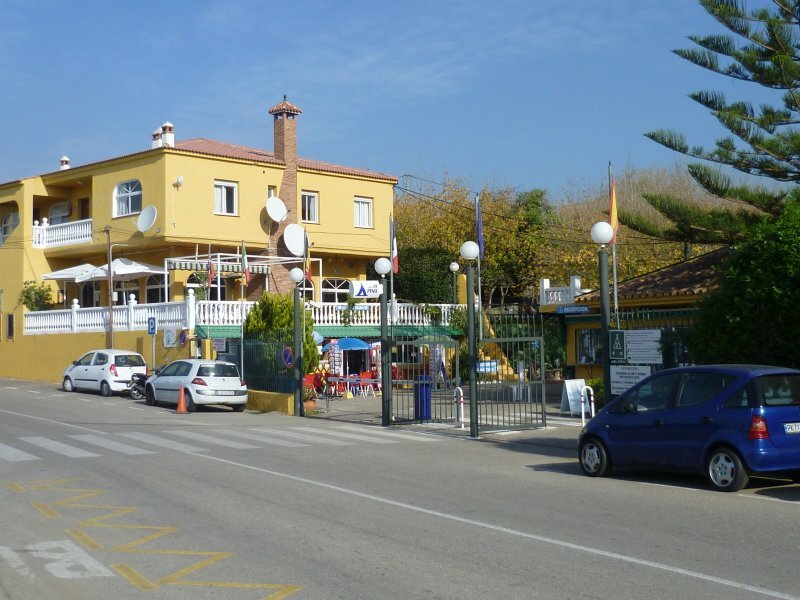 The site is obviously very popular with Spanish holidaymakers who have their caravans permanently sited but the motley collection of rickety fences, the sagging awnings and flapping tarpaulins give it a rundown appearance. During the winter months when all my visits have been made the site is very quiet with only small numbers of touring caravanners on site but I can imagine it being very noisy in the high season. A discount for ACSI card holders is available. Wifi is also available at an additional cost. The toilet blocks are clean, modern and very nicely tiled however, the owner has chosen not to fit any of the toilet pans with seats or lids. ACSI cards are accepted and since there is a site-wide wifi connection at €17 per night, a stay here is well worth while. Most caravanners use the site as a one night halt but there is enough to see in the surrounding area to justify a longer stay. The arched entrance needs care for long vehicles. The site is situated about 10 miles east from the A4 Madrid road on the outskirts of the village of Riaza. 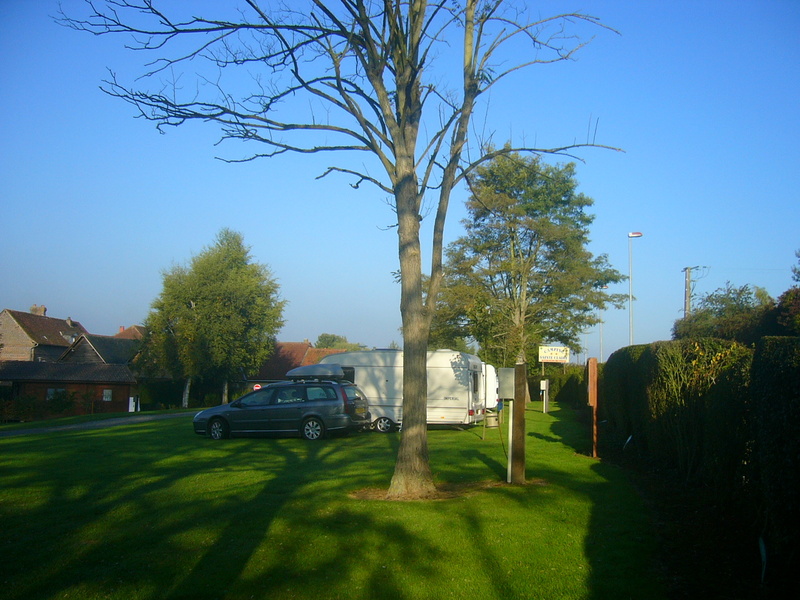 The site has around 200 pitches for caravans, all with adjacent 10amp electricty bollards. There are two toilet blocks one of which is closed during the winter months. The one in use when I visited in November was very modern, clean and heated. Hot water in the showers was good with fitted mixer taps. I was unable to find any stand pipes for Aquaroll filling, consequently I had to fill up at the washing up sinks. There is wifi throughout the site which is charged for however it’s free in the bar area. Because of its high altitude, nights in winter can be very cold. The temperature when I arrived in late afternoon was 18C but by bedtime had fallen to zero. In the low season ACSI members qualify for a discount. The site is situated on the outskirts of Villafranca de Cordoba which is about 14 miles from Cordoba and about a mile from the A4 motorway. There are around 70 pitches available for tourists with another 15 or so used for rentable wooden chalets. There’s only the one toilet block which is centrally placed. Pitches are all level and of a good size size with those on the ends of roads being slightly bigger. Pitches are separated by four foot high hedges with trees planted within the hedges. 10Amp electric supply boxes are modern with one box serving up to eight pitches so a full 25metres of cable may be required. The toilet bock is of a modern design which was always clean. The building houses toilet cubicles, shower cubicles and a row of hand basins with adjacent power points. Toilet rolls are not provided in the cubicles however there is a dispenser. Outside there are deep sinks for clothes washing and stainless steel sinks for crockery and cooking utensils but only with cold water. All the taps are of the self-closing variety. At the side of the building is a well-fitted chemical disposal point. Free wifi is available (only close to the reception building – according to the receptionist) however I’m getting a good reception in my caravan about 100 yards away. In the low season ACSI members qualify for a discount. But if you drive a motorvan and tow a trailer, the trailer is charged extra for. The site lies to the east of Malaga along the A7. To find the site, leave the A7 motorway at Km285 and take the road down hill, towards Torrox Costa. At the large roundabout, go left and follow the camping signs. The site is terraced and divided into four areas with some quite steep hills on the internal roads however, all the pitches are more or less level. Some descriptions of the site describe it as being set amongst avocado groves but that is outdated – over the last ten years more and more avocados have been felled and replaced with other types of tree. Now there are very few avocados left. There are still lots of trees on the site – making some pitches difficult for large or high vehicles to park. The site roadways are well surfaced and of reasonable width. 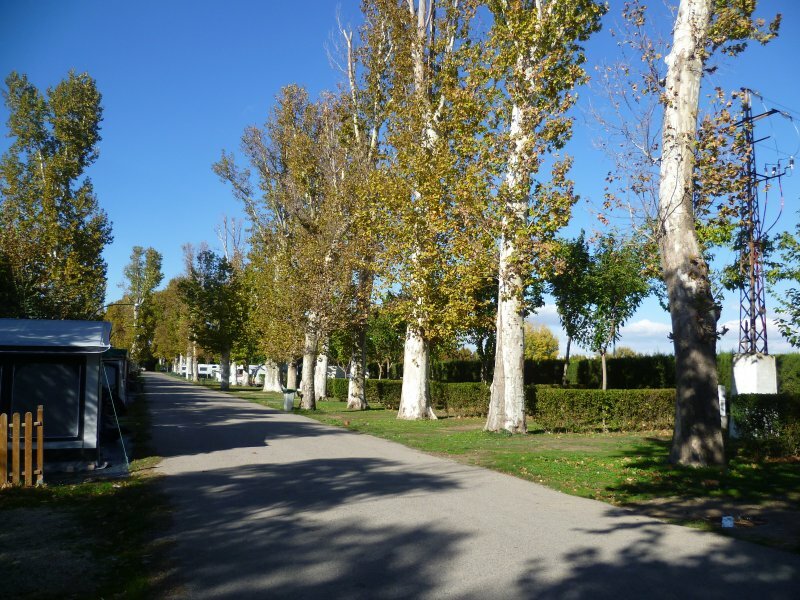 The site has a mixture of touring pitches of which there are around 380, bungalows available for rent and also an area of privately owned bungalows which have permanent residents or part-time owners. Some bungalow owners were once visiting touring caravanners. There are four toilet/shower blocks spread over the site with hot and cold water within but only cold water at the outdoor sinks. Behind the reception area there is a facility for motorcaravan discharge and refilling of water tanks. In the same place is a small room with a washing machine. The site has a small shop near the entrance and within the boundaries of the site is a bar/restaurant serving meals. The site is open all the year and a discount is available for ACSI card holders. Also for campers who wish to stay for a month, by paying around €280 on arrival, a stay of 30 days can be had. Electricity is charged extra per month. The site does not take bookings and because of its large area, very rarely does it become full. The site is set on higher ground and about 600kms back from the seashore. In Torrox Costa, which is walkable along the river bed is an attractive promenade with several restaurants and bars. On the main road there a four large supermarkets – Lidl; Aldi; Mercadonna etc. An alternative route to southern Spain. An alternative to driving through France is to take the Brittany Ferries crossing from Portsmouth to Bilbao or Santander. Depending on the departure time will depend on whether you spend two nights on board or just one. Leave late at night, spend two nights on board and your driving starts early in the morning. Leave late afternoon, spend one night on board and it’s evening when you arrive. 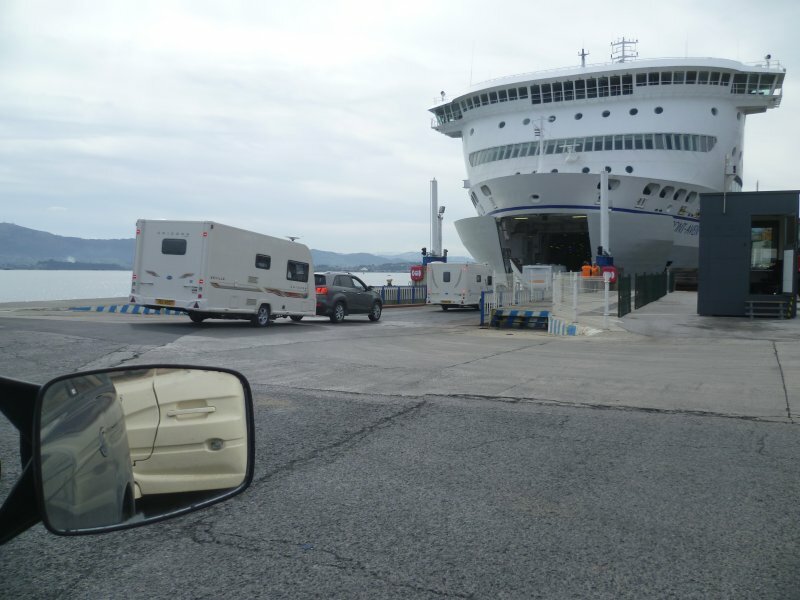 At first glance, the long Spanish crossing may appear much more expensive than a Dover/Calais fare, but add the fuel for an extra 1200 miles through France, two nights site fees and some toll charges, and the long crossing looks more attractive – especially the winter fares. It’s this option which I’ve taken for the past three years. And since I’m no longer in a hurry to arrive at my destination, I plan my route according to where I want to go and what I want to see on my journey through Spain. So my second route begins in Santander, then to Salamanca, on to Avila, then to Caceres and Merida, down to Seville and finally Malaga province. 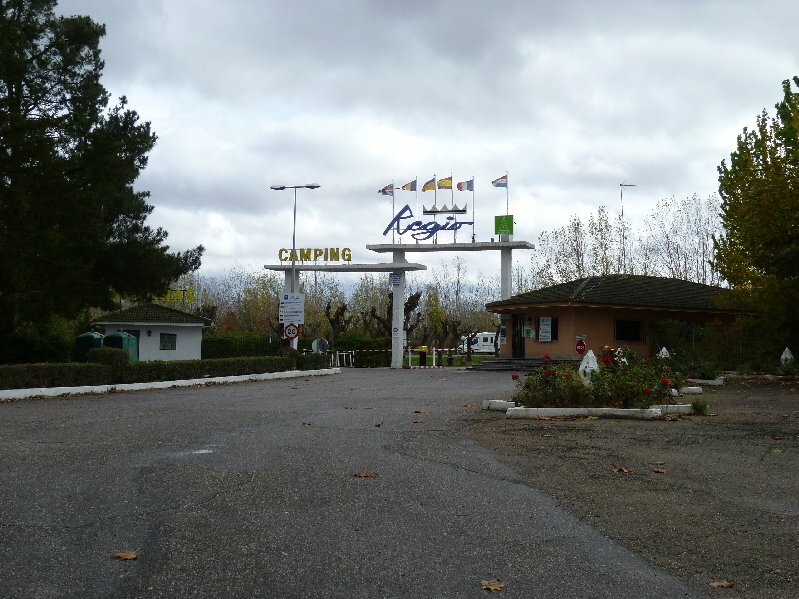 Camping Regio at Salamanca is easy to find as it is situated between the N501 and the A50, with the entrance being off the N501. The plot contains the Regio Hotel with the campsite behind it. During the winter months the campsite reception is closed so it’s necessary to book in for the campsite at the hotel reception. Once through the barrier which opens by means of an electronic tag, the central avenue leads to the toilet block at the far end of the site. Narrow lanes lead off the avenue to the back-to- back pitches which are of reasonable size. Power boxes are situated so that six pitches use the same bollard. The supply is rated at least 10amps however, all the sockets are of the two pin and earth type with many of them having lost their cover. The showers and toilets are all contained in the same building so campers on some pitches could have quite a long walk. The showers and toilets are of a good standard. My arrival in November was after several days of heavy rain and most of the pitches had standing water on them. Consequently I parked on the edge of the central avenue for the few days I stayed there. An ACSI card discount is available out of the high season. Meals are available in the hotel and a discount is given to campers. Lidl and Mercadonna supermarkets together with the historic centre of Salamanca is three miles away from the site. This site is a couple of miles from the A66 motorway. Leave the motorway at KM545 and take the N630. At the second roundabout take the 3rd exit which sweeps around into a service road running parallel with the main road. After a short distance the site entrance is on the left; the same entrance as that to the football stadium. It will be necessary to stop before the barrier to book in when at the same time you will be given an electronic tag with which to raise the barrier. You will be given your pitch number together with your key. Pitches, which are of a good size are set out back to back with access lanes across the front of each pitch. Most pitches have a raised green plastic sheet giving shade over the caravans. To one side of every pitch is a locked cubicle of around five feet square. Each cubicle contains a toilet pan, a handbasin and a shower both with hot and cold water supplies. The hot water heater is of the instantaneous type so the water is always hot. Each room is beautifully tiled and ventilated. To one side of the cubicle is a power point, a plastic table with two chairs. Together with the site-wide wifi, this is one of the best equipped sites I’ve ever had the pleasure of staying on. Also on site is a restaurant. An ACSI card discount is available out of the high season. Several supermarkets and the historical town of Caceres is about three miles away. When you are moving on, if you intend to travel southwards, it’s worthwhile heading north, before turning south at the Autovia junction. It will save towing through or around the town. Travelling south from Seville on the NIV, take the exit left at Km.555 signed Dos Hermanas. This is a family owned site and is said to be one of the first sites to be opened in Spain. It has pitches for 180 touring vans, all of which have shade from nearby trees. There are no permanent vans on site. The ground is a sandy soil which drains very quickly. Electricity bollards provide a supply rated at 7.5amps. The water taps are not Aquaroll friendly since they are placed on quite ornate pedestals. The toilet and shower block has recently been refitted to a high standard. Curiously, there is no street lighting on the site, so it may cause problems after sunset. The site is open almost all the year however, they close just before Christmas and reopen in early January. During the high season a swimming pool is available. Discount cards are not accepted. This is a large site built on a hill side however, all the pitches have been leveled. Those on the flat top of the hill have a wonderful view towards the hill village of Olvera whilst in another direction there is a view across the valley. The pitches are of ample size with electric bollards and water taps close by, and each pitch has a capped waste water drain. There are two toilet blocks both of them modern and well equipped. The reception offers an internet connection however, it’s charged at €2.60 per 24hrs. The town is built on a very steep hill with the church and the castle situated on its highest point. Lower down in the town is a Mercadonna supermarket. Towards the end of the Franco period it was planned to build a railway line from Algeciras to Antequera. The bed was excavated; the tunnels were built, the stations were built but the rails were never laid. For years the project remained overgrown and neglected however, the track has recently been revived turning it into a cycle and walking path. It passes through some breath-taking countryside. This site is very close to the dock area at Santander. So it’s a useful stop if arriving in Spain at night. It’s around 5 miles away across town but worth doing the 10 miles via the motorway. It’s a large site but in the winter months only a small portion of it is in use. The pitches used in the winter are separated by trees and they are very deep but also quite narrow. The electric sockets are in a large box on the boundary wall. The washing up area is in need of some updating, but the toilets and showers which are in the same block but on the other side have already been modernized. The lighting is on a timer switch so if you delay too long it’s possible that you’ll be left in the dark. The ground holds the water during prolonged periods of rain and since it’s usually November or March when I use the site, I park on the roadways or in the carpark. There are no discount schemes available and the nightly charge is the same throughout the year. Wifi is available which is included in the nightly fee. Their website states that dogs are not accepted however, I’ve been on the site when my neighbour clearly had his dog with him. 3. Calais to Costa Brava. The route begins in Calais at the ferry port having taken an afternoon sailing from Dover. After a stop for a fuel fillup I take the A16 towards Boulogne. In approximately 25 miles the toll section begins. Here you have an opportunity to leave the motorway and join the N1. If you choose the toll motorway at Abbeville you will need to pay around €12 (if you are towing). At Abbeville, leave the A16 and take the A28 towards Rouen. You are on a toll-free motorway. 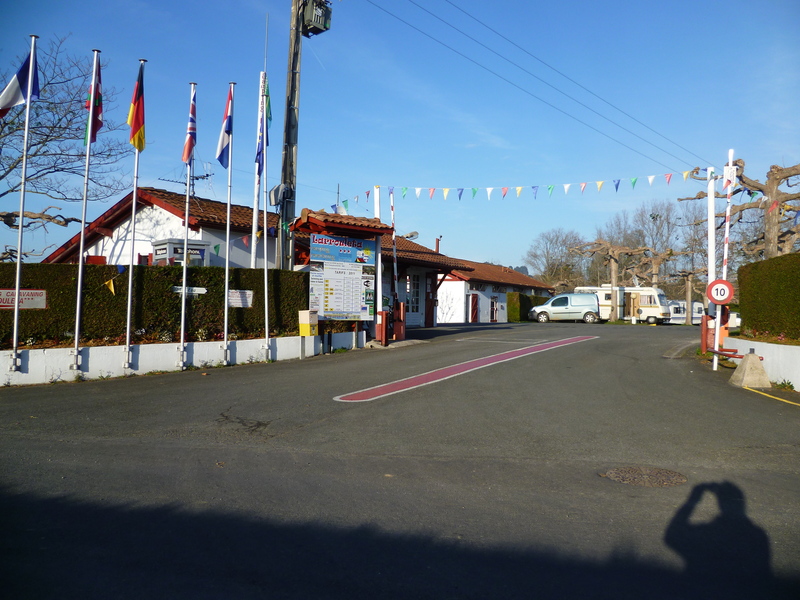 After about 35 miles, at Junction 9, I stop for the night at Camping Sainte Claire in Neufchatel-en-Bray. There’s an opportunity to top up your tank at the supermarket filling station in the village. Next day I rejoin the A28 towards Rouen and I’m going to do 235 miles to Bourges. The route then follows the A154 which later becomes the N154. Before that you need to cross or go round the City. My choice is to take the road marked N15 on old maps but on newer ones it’s the D6015 to Pont du l’arche, cross the A13 and join the A154. At the roundabout at Igoville there’s a slip road which enters the carpark and filling station for a SuperU store. The 154 is a good dual-carriageway road that continues until it meets the N12 at Nonancourt. Here you turn left along the N12. The route rejoins the N154 at Dreux and continues to Chartres. Keep to the ring road around the City until it rejoins the N154. I stay on the 154 until I can join the A10 at Artenay then to Orleans where I take the A71 toll-motorway down to Bourges. I leave the motorway to spend the night at Camping Robinson. Next day you rejoin the motorway and head south. At Clermont Ferrand the peage finishes but the motorway continues toll-free. After 140 miles you reach Issoire and if another over-night stop is called for, just on the edge of the town you’ll find Camping du Mas. 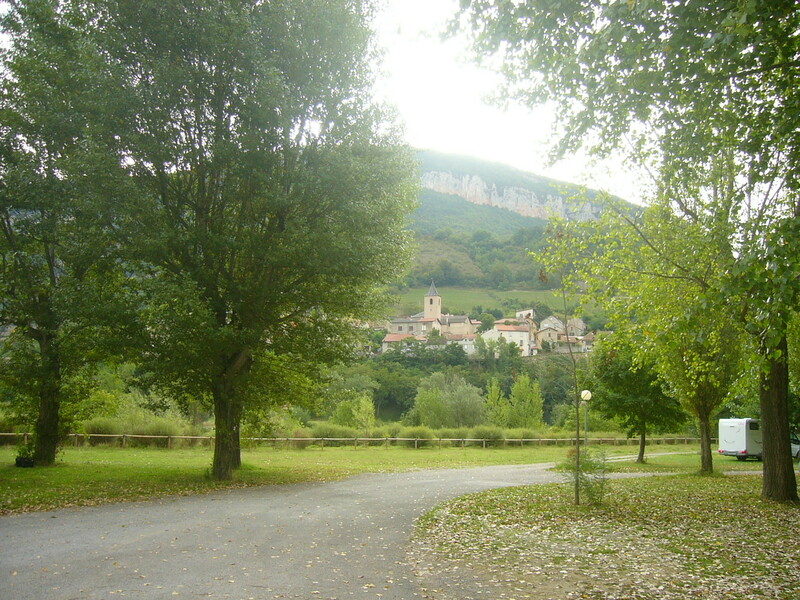 However I usually push on for another 100 or so miles then leave the motorway and stop in the village of Aguassac and go to Camping La Belle Etoile In the village the road that follows the Gorge du Tarn begins. The site is on the left just before the railway crossing. which being the highest bridge in the world – at least it was when I last drove over it, is worth seeing. But there’s always the journey home. Eventually the route arrives at the A9 which is peage once again. And continues so all the way to the border at Le Perthus. I am now on the Spanish AP7 which is a toll-road, but not for long. In less than 15 miles I leave the motorway, take the ring road around Figueres, then head for Castello d’Empuries. 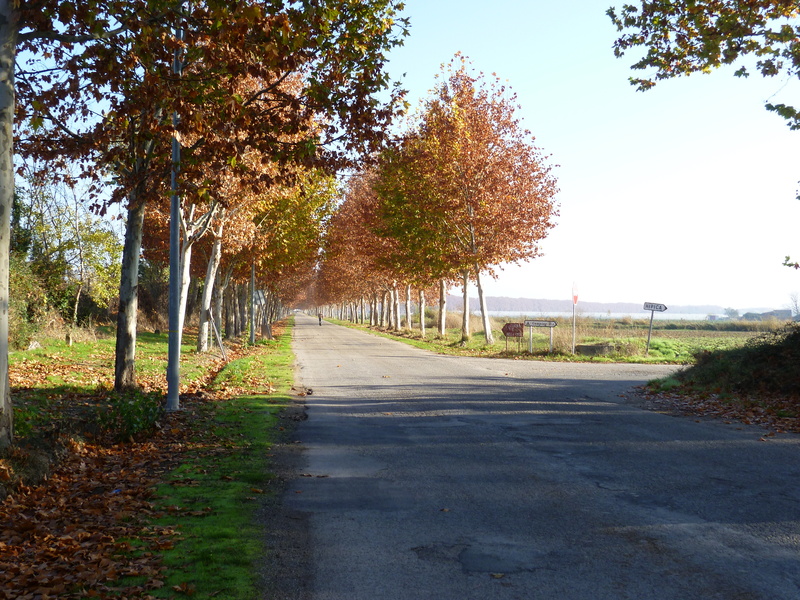 Before reaching the village I turn right and drive across the marsh to Sant Pere Pescador. Just beyond the village there are several well-known camp sites but I am heading for Camping Las Palmeras, one of the smaller family owned sites. Les Epinettes – Close to Calais. 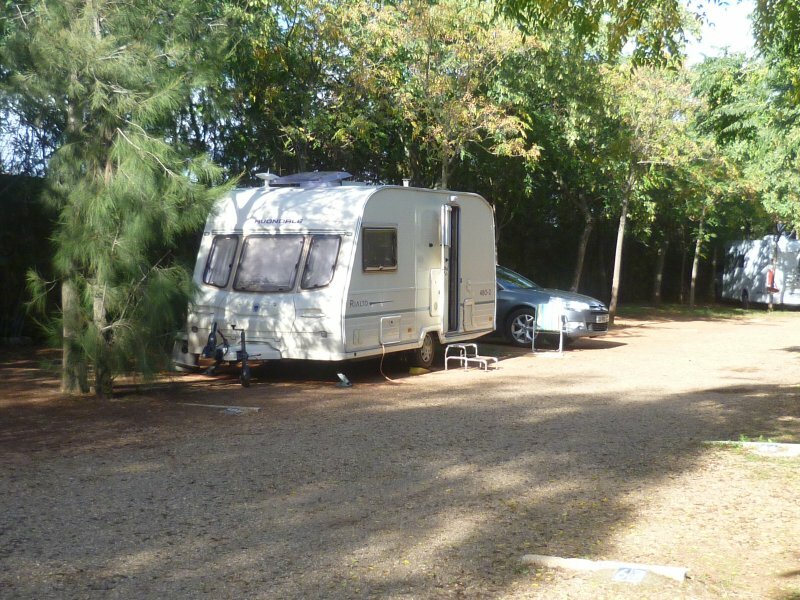 Les Epinettes is a small campsite on the outskirts of the village of Peuplingues not far from Calais and about two miles from the A16. Being so close to the Tunnel and Port it makes a very handy stopover either on arrival or prior to boarding. 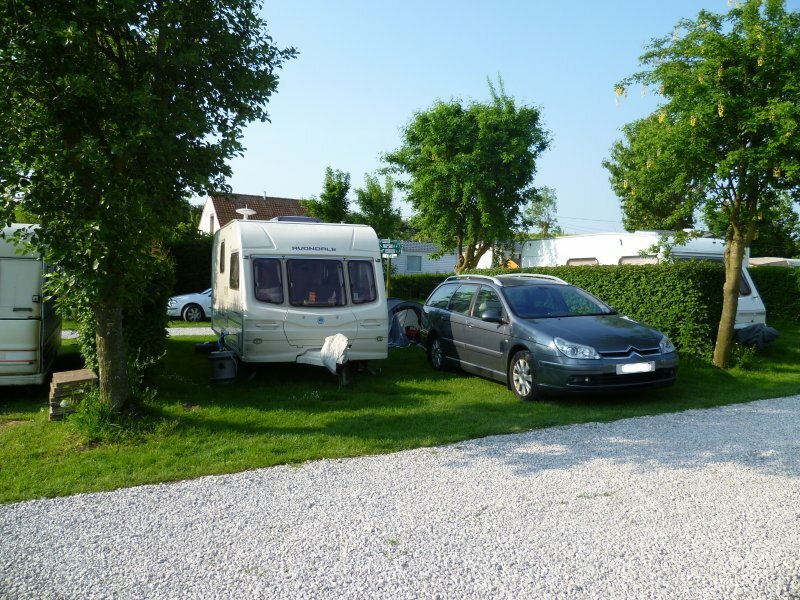 Many of the pitches are taken up with mobile homes but those nearer to the entrance are of fair size and used by tourers. The pitches are divided by substantial hedges. Electric hook-ups have CEE17 blue connectors but they are only rated at 5 amps. There are two small toilet blocks which are of a reasonable standard. Showers require a token from reception. In one of the toilet blocks there is a facility for chemical disposal but curiously the owners have not provided any means of rinsing. During my stay reception was closed more often than it was open making it difficult for booking in and settling before departure. Usually I needed to knock at the house at the end of the lane. In spite of some shortcomings, at €13 per night including electricity, a few nights stay is extremely good value. Many directories advertise the site as not being open all the year however, I’ve had no difficulty in staying in February. When entering this site you will not fail to be impressed with how well it is tended by its owners. Being close to the A28 between Abbeville and Rouen it is popular as a night halt. The site has around seventy pitches of a generous size and on some it is possible to drive through. There are two amperages available – either 6 or 10amps which you should specify upon arrival. The toilet block is clean and tidy without being luxurious and toilet paper is required. There is an internet connection which is an additional charge. Close by in the village is a supermarket with filling station attached. Leave the A71 at Junction 7 and take the N151. If you approach this municipal site from the east, the entrance is on the left but you need to enter the slip road to the right and cross the road on the green light. Reception is staffed by helpful staff all of whom appear to speak English. 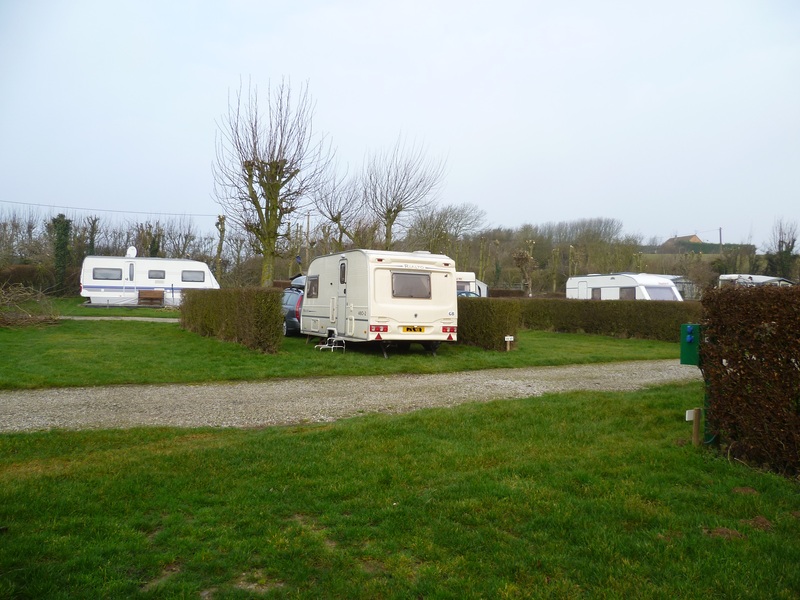 There are around 80 pitches for caravans with the plots being separated by mature hedges. Electricity bollards and taps are close by with a capped drain for waste water on many pitches. Toilet blocks are modern and kept clean and tidy. Hot water is plentiful. There’s a free wifi connection but it requires a code which is obtainable from the reception. This site is situated conveniently close to the A75. Although I’ve only ever used it as a night halt, it could also be used for a longer stay. There are over 100 grass pitches all of which are a quite generous size. Most of them are individually hedged Road access around the site is good with a barrier at the entrance. I was pleased to see that the barriers have replaced the former bollards which sank into the road surface. Electric points are rated at 10 amps and use modern blue connectors. There are water points close to each pitch, and two toilet blocks, one in need of some updating. The site has a bread van which calls every morning. Nightly site fees are quite high compared with other Municipal campsites, however it is in a very convenient position. The site is not a member of the ACSI scheme. There’s a large Carrefaure on the opposite side of the A75 which has a filling station attached. Just outside the site entrance there is a rather attractive lake. 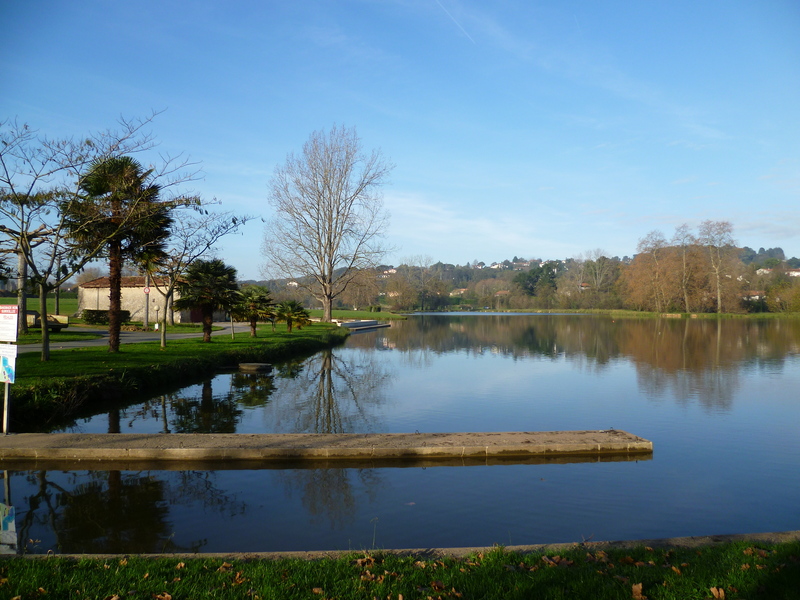 La Belle Etoile at Aguessac is situated right on the banks of the River Tarn. There are 75 pitches, some with electricity and some without. The pitches set back from the river bank have the benefit of trees giving some shade. The facilities are near the entrance where there are shower and toilet cubicles and ranges of hand basins. All were clean and tidy. A short distance from the site is a side road which leads through the Tarn Gorge. 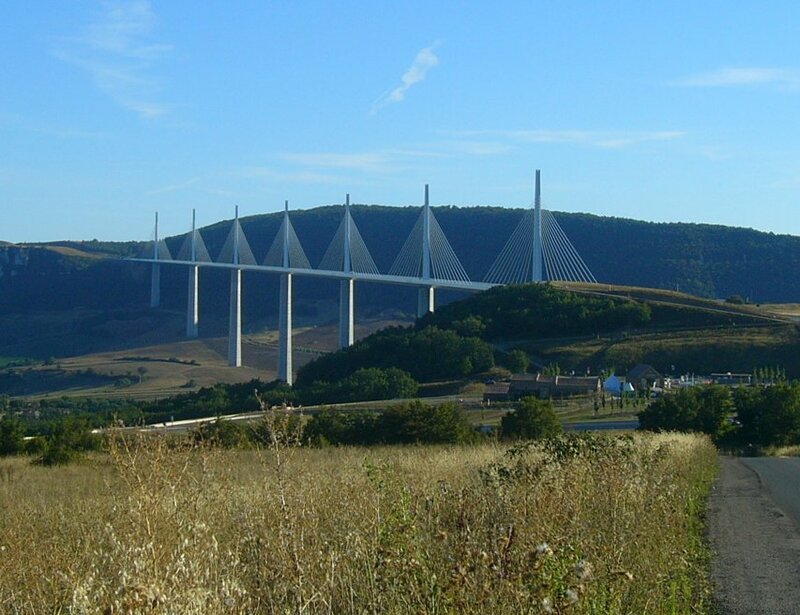 For supermarkets you need to head towards Millau and at the first roundabout if you take the first exit up the hill, at the top there is a Geant store with filling station nearby. 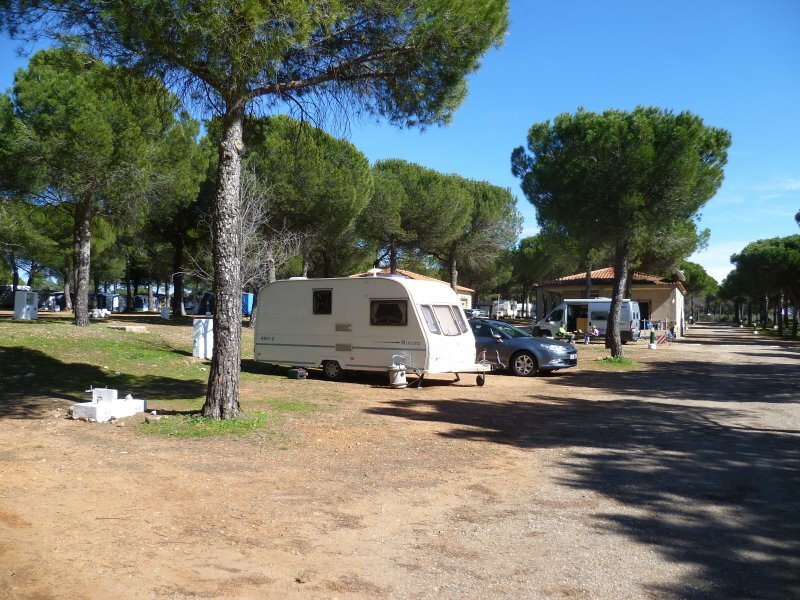 Camping Las Palmeras – Sant Pere Pescador. Las Palmeras is a smaller, family owned site. The pitches are all of around 100 sq.mtrs with electricity at 10amps and water nearby. There are some super pitches with drain water outlets. The toilet block is near the site entrance where there are toilet and shower cubicles and some cubicles with handbasins – all with hot and cold water. At the ends of the block are facililities for washing up. At the rear of the block is an area for car washing. Also near the entrance is a restaurant with bar attached where in the high season entertainment is arranged on some evenings. Within a walled enclosure are three swimming pools graded according to age and ability. In a far corner of the site is an area for tennis, football and a gym. There are some studios and mobile homes on site for renting. From the entrance, the beach and sea is about 800 mtrs.